So, I’ve already given the wrong impression in that opening paragraph. I haven’t seen the country. I’ve seen a very small portion of two states in the north, Uttar Pradesh and Rajasthan, as well as the National Capital Territory of Delhi. I’ve only scratched the surface of this vibrant, exciting part of southern Asia. But it was a good start. And, to be honest, India – if you hadn’t realised – is huge. So doing it in chunks is the only real option for those of us beholden to the man, unwise enough to have foregone a gap year. India is approximately 3.3 million kilometres squared, and with around 1.2 billion inhabitants it’s the most populous democracy in the world. To say that India is ‘bustling’ would, then, be an understatement. Every home, street and mode of transport literally groans with the weight of its occupants. Worth pausing here to acknowledge that – beautiful and vibrant the country may be – but it’s impossible not to be affected by how incredibly poor most of those inhabitants are. Despite being one of the fastest growing economies on the planet, most of the wealth of the country is held by a tiny fraction of the population and the majority of people you see live very simple lives. It’s hard not to sound trite when you say it’s humbling, or – worse – to fall into the trap of romanticising the existence of sari-clad women carrying firewood home on their heads. But this is the reality for millions: a meagre rural village life, where the fields are tended by hand with the help of oxen and camel; or a meagre city life, where many build their homes amongst the rubble and litter, working as roadside barbers, bone doctors, tailors or in a plethora of other small cottage industries in makeshift shops constructed of corrugated iron and tarpaulin. These city dwellers live alongside an array of domestic animals – literally alongside – with cows, pigs and goats sprawled on porches and wandering aimlessly amongst the honking traffic; they get their water from hand pumps on the street corner, share giant communal pots of daal and queue barefoot to attend the temple. I know that description is far from adequate, and – trying desperately not to sound pompous – I recognise that you only truly appreciate the reality by seeing it in person, but I’ll create a separate blog entry with some photos of street life to help paint a better picture. I just wanted to explain upfront that, while much of what follows is focused on the stunning World Heritage sights and accounts of the colourful history of opulent kings, I wasn’t blind to the other side of India’s coin. We stayed first in a colonial style hotel in Delhi, my dad and I, where we were welcomed with garlands of marigolds and sweet lassi. After a nine-hour flight, a bath and a rest would have been welcome, but instead – conscious of the short amount of time we had in the capital – we set straight out to see some of the sights of New Delhi. Built during the British rule or Raj period, the area was a showcase for the Empire and so the antithesis of everything I’ve just described: by far the most spacious, clean and picturesque streets of the whole trip. We saw the India Gate – a war memorial for Indians killed during WWI and the third Afghan war – and the official residence of the President of India, which served as the palace of the Governor-General of British India before independence in 1947. Next we drove over to Jami Masjid, the largest congregational mosque in Asia. 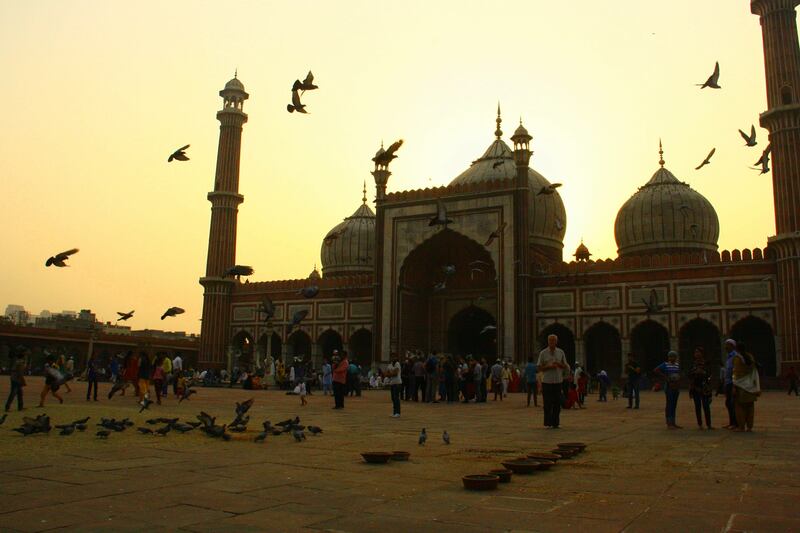 The mosque was built in the 17th century by Emperor Shah Jahan and took nearly five thousand workmen to construct. The huge courtyard accommodates up to 20,000 people, especially during Friday prayers and Id. It was calmer when we were there, close to dusk on a Saturday, but you could imagine what a spectacle it would be filled with a sea of worshippers. Donning paper shoes, we explored the marble domes and watched as people prepared themselves in the central ablution tank. It is a grand and peaceful site, in direct contrast to the bustling bazaars and night markets that surround it. The last stop, before a well-earned dinner of paneer makhani, butter chicken and dum bhindi, was Raj Ghat – the memorial to Mahatma Gandhi – a simple black marble platform that marks the spot of his cremation. 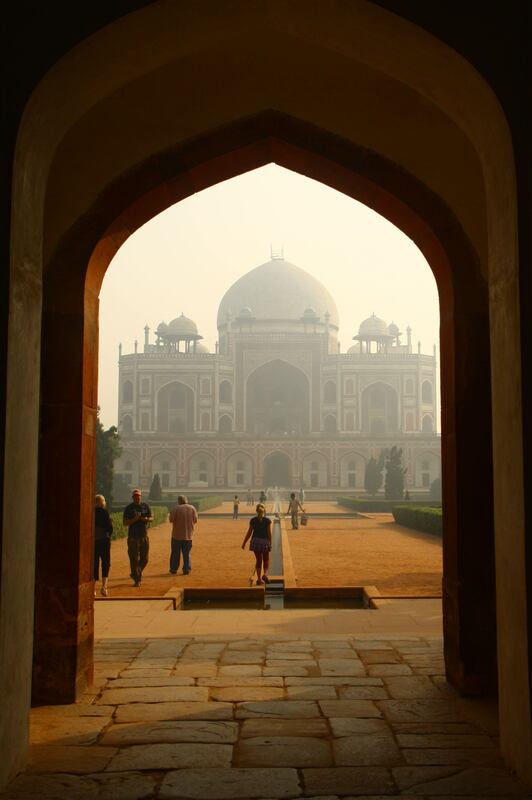 During the rest of our time in Delhi, we took in two major UNESCO World Heritage sites. Humayun’s Tomb is the memorial to the second Mughal emperor and is the first great example of a garden tomb, thought to be the inspiration for the Taj Mahal. It’s a very impressive sight indeed, commissioned by Humayun’s ‘senior’ widow and built by a Persian architect. It was lovely to walk around in the slightly cooler early morning air, watching the chipmunks skittering around and the jays and parakeets circling. The second sight of historical significance was the Mehrauli archaeological park, and specifically Qutb Minar, the world’s highest brick minaret. The area was built during the time of the Delhi Sultans, when the fabulous wealth of India attracted Arab traders and raiders. Muslim rulers established themselves in northern India and built an empire that lasted from around the turn of the first millennium until the early 16th century. Qutbuddin Aibak, a slave general, built the first storey of the brick minaret and a mosque to proclaim his victory over the Rajputs. The subsequent stories were added by his successors and the architecture shows a fusion of Hindu and Islamic styles, with decorative panels, domes and arches. It was here that I spent most of my time being followed by a little fan club of Indian teenagers who were insistent on having their photo taken with a young(ish) western girl. I obliged – about ten times – before hiding in Iltutmish’s tomb for some respite. Other things of note during our time in Delhi: an amazing lunch of baingan ka bharta (puréed aubergine curry, a speciality of the Punjab region) with vegetable paratha (you didn’t think you’d escape constant mentions of food, did you?) and a colourful Sikh wedding in a carpark. But after too short a time, we journeyed forth into the countryside of Uttar Pradesh and onward to Agra. The countryside was dotted with tall chimneys, kilns for brick making, and farm workers harvesting the land, tilling fields using bull and cart. 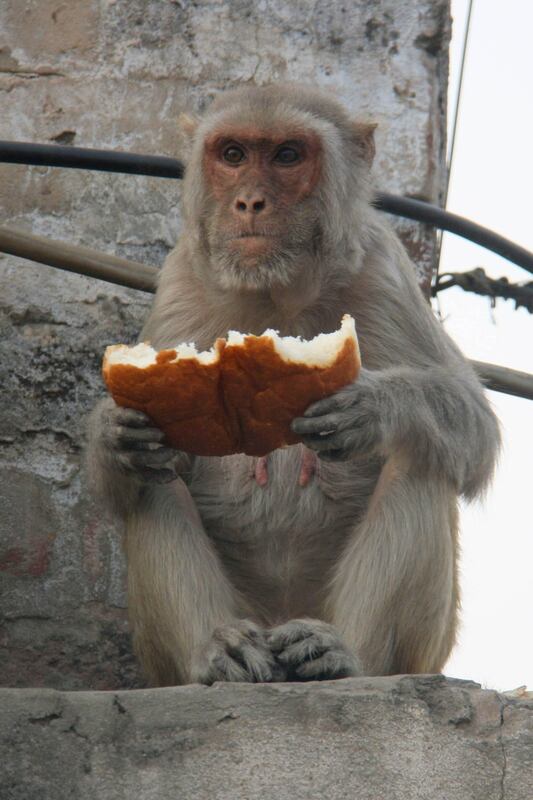 Agra at first doesn’t feel much less rural, with camels, oxen and donkeys on the bumpy roads and abandoned residential areas now overrun with rhesus macaque monkeys. 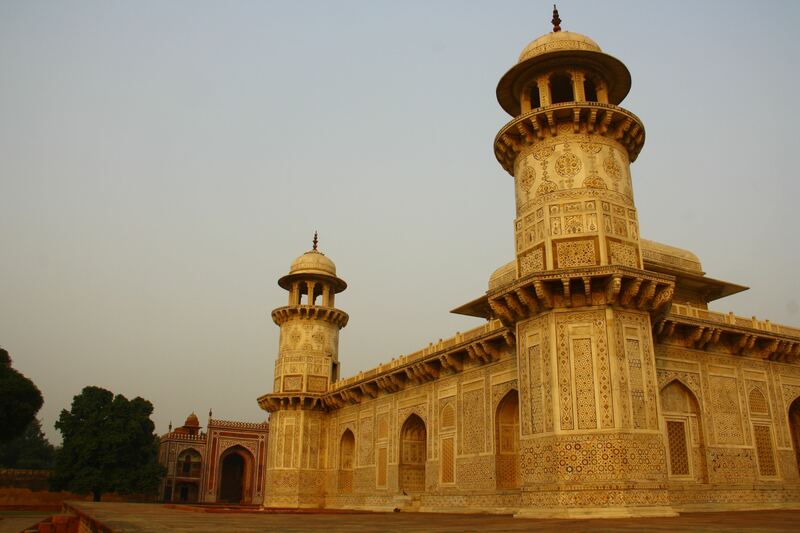 Agra was the imperial Mughal capital during the 16th and 17th centuries. 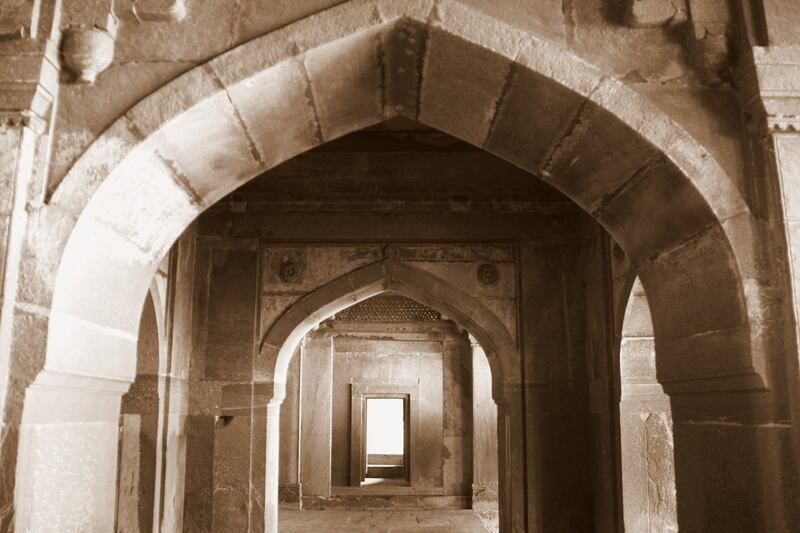 It was from here that the emperors Akbar, Jahangir and Shag Jahan governed their vast empire and the city flourished, attracting artisans who built luxurious forts, gardens and mausoleums. The city, of course, has some big hitters. Foremost among them: the Taj Mahal. One of the modern wonders of the world and one of the most photographed spots on the planet. It really does not disappoint. 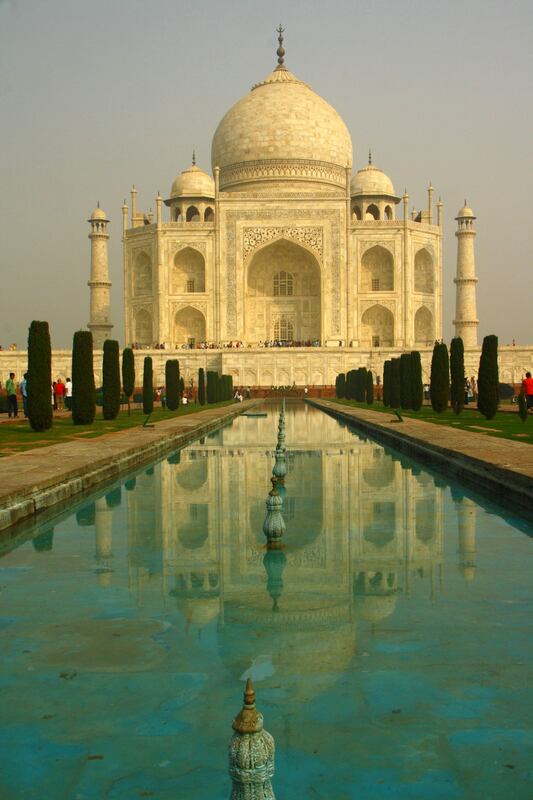 Built to commemorate Mumtaz Mahal, the favourite wife of Emperor Shah Jahan, it is breathtakingly beautiful. I don’t think I’d appreciated before the effort that was taken to make it so symmetrical, and it’s perfect proportions certainly enhance it’s impact. Gazing at its shimmering splendour, you can see why it’s variously described as a prayer, a vision, a dream, a poem, a wonder. We spent two hours wandering around the main tomb, lotus pool and two flanking mosques, marvelling at the inlaid marble, tall calligraphic panels, filigree screens and towering minarets. I can’t recommend it enough. Whether you consider it the greatest monument to love ever created or not, it is undeniably sublime. That same evening we also visited Itimad-ud-Daulah (known locally as the Little Taj), a gorgeous white marble and mosaic tomb built for the Lord Treasurer of the Mughal empire by his daughter. On any other holiday, this would probably have been a highlight in itself, but on a trip with such tough competition it was merely a sideshow and a prelude to a walk through the nearby Mughal Gardens, from where you can see across the Yamuna river to the Taj. We arrived in the gardens just before sunset and the views were incredible. 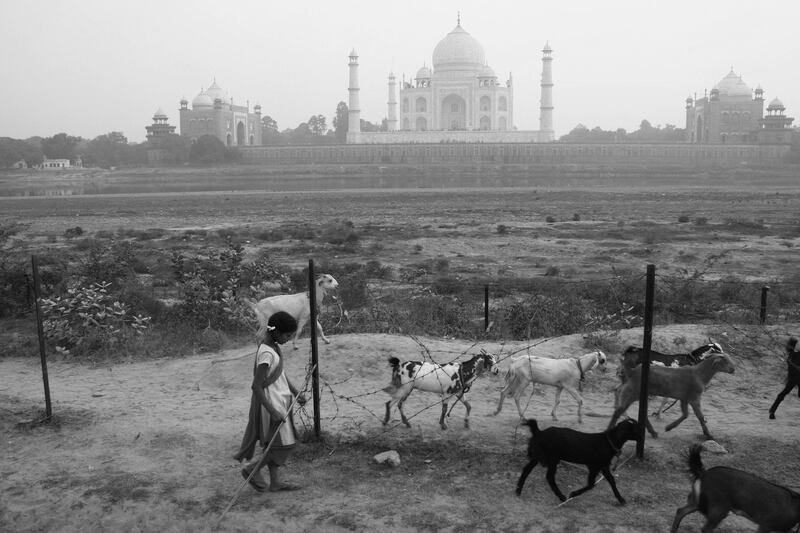 The dusty haze of the day prevented a really strong sunset, but seeing a young girl herding goats past the yellowing sky in front of the Taj is a memory I’ll treasure. While in Agra, we also visited the fort – another UNESCO site – and Fatehpur Sikri, a ‘ghost town’ about an hour’s drive outside the city. The latter was a real surprise. I hadn’t known what to expect, but was bowled over by the place. Built by Emperor Akbar, it was the political capital of the Mughal empire for only a decade or so, but is an architectural wonderland of palaces and pavilions, and – in its heyday – would have also been surrounded by beautiful parks, residences and mosques. In the 16th century travellers noted that is was larger and more populous than London. However, only a short time after being completed, the city was abandoned in favour of the more militarily strategic Lahore, and became virtually unknown for hundreds of years. Its a rubbish analogy, but some of the architecture brought to mind the Indiana Jones film The Temple of Doom. It’s a ruined – though well preserved – kingdom, with dark tunnels of arches and plenty of decorated hidden knocks and crannies. My favourite part was the Panch Mahal, a five-storey open pavilion overlooking the Pachisi Court, where Akbar’s queens could sit and savour the cool evening breeze and play a version of Ludo, dancing between each move. 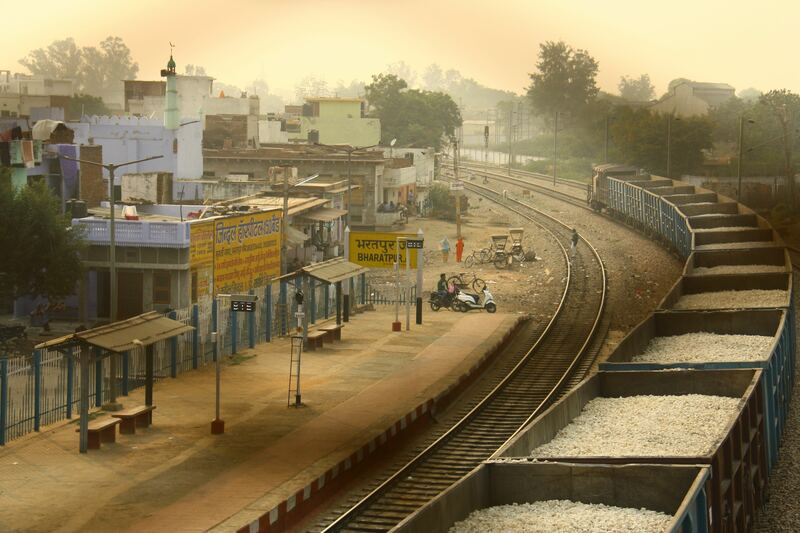 Leaving Agra, we took a train from Bharatpur to Sawai Madhopur. The train journey was an experience in itself – not quite Wes Anderson’s Darjeeling Limited (my reference point and inspiration), but not far off. People take their lives into their hands to travel on the railway: hanging off the side of the train, crossing the rails to get to the platform, wandering down the tracks with milk canisters and teapots. We, thankfully, had seats, but it was great to watch all this going on. Out of the window, rural life unfolded: farm-stays made out of twigs, cattle wandering in and out of the home, children carrying water jugs on their heads, people working on the track as we navigated past, including women in saris working cement mixers. And all manner of wildlife crossed the tracks during the short journey, including dogs, piglets, goats, cows…small children. Happily none of these were stationary on the track long enough to hold up our journey. We arrived in Sawai Madhopur in the pitch black. There were few lights in the station and no street lighting at all on the roads outside. When we got to our hotel, a nice family run place near Ranthambore National Park with a lovely pool area (and delicious masala dosas for breakfast), there were semi-frequent blackouts. We had a thrilling couple of days in Ranthambore, but I’m conscious that this entry is already quite long, so I’m going to do a separate blog on the park (thereby also allowing for more animal pictures to be included), and skip to Jaipur. I think that Jaipur was my favourite of the three cities we visited. It’s incredibly colourful, the sights are fantastic, we had amazing weather and we enjoyed excellent spicy Rajasthani food like lal maas (a rich mutton dish), lots of different vegetable curries, amazing rotis and naans (the breads in India are fantastic) and various interesting desserts like gulab jamun (deep-fried milk and flour dumplings in a thick syrup). It was also – unfortunately – the only time on the trip that I succumbed to a stomach bug. Hey ho. It would have been pretty much unprecedented to avoid one completely. 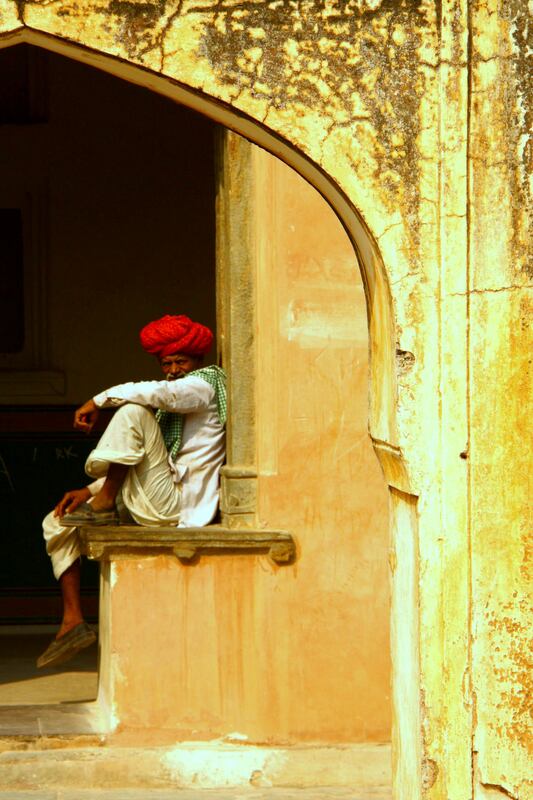 Jaipur is known as the ‘pink city’. 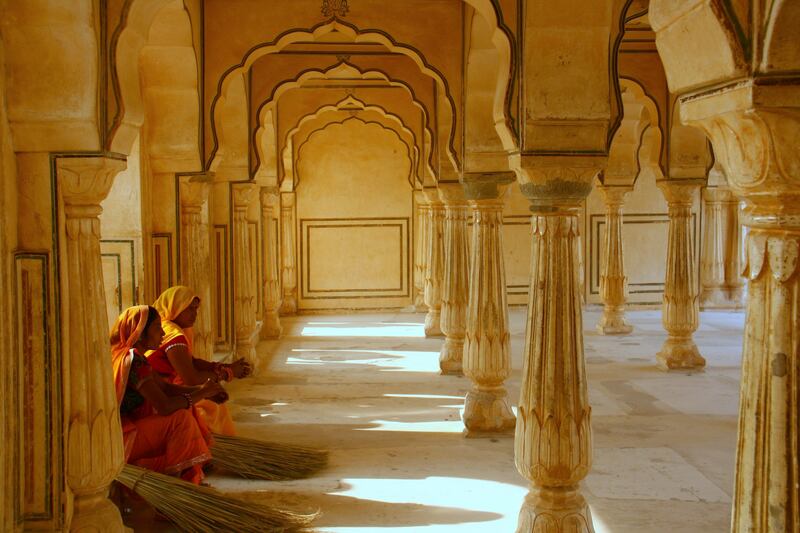 It’s a labyrinth of bazaars, opulent palaces and historic wonders. On the streets, camels and elephants jostle with mopeds, turbaned elders and snake charmers sit on street corners, and monkeys clamber over the old city walls. 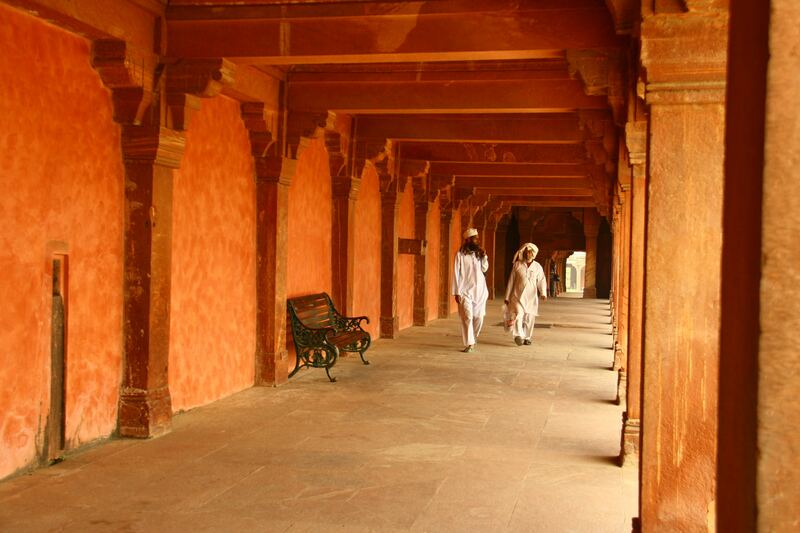 Those walls were built by Sawai Jai Singh II, a statesman and scholar who ruled for 40 years. It is one of India’s finest examples of a planned urban city, with a grid of nine sectors representing the nine cosmic divisions of the universe and seven proud gates. At dawn on our second day there, I took a jeep ride to the base of Amer Palace (otherwise known as the Amber Fort) and then an elephant along the battlements to the palace itself. 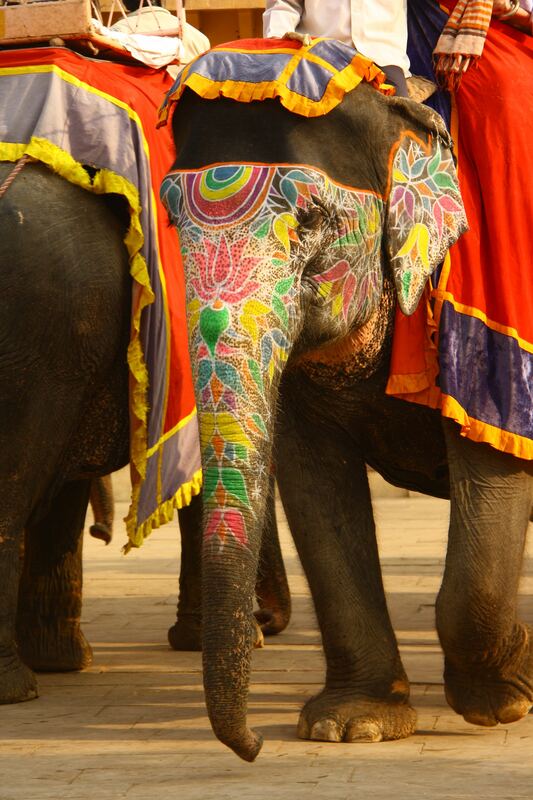 It was only my second time riding an elephant and made me quite giddy – they’re such majestic creatures and mine, adorned with bright face paint and tassels, was a gentle soul and provided a smooth ride. 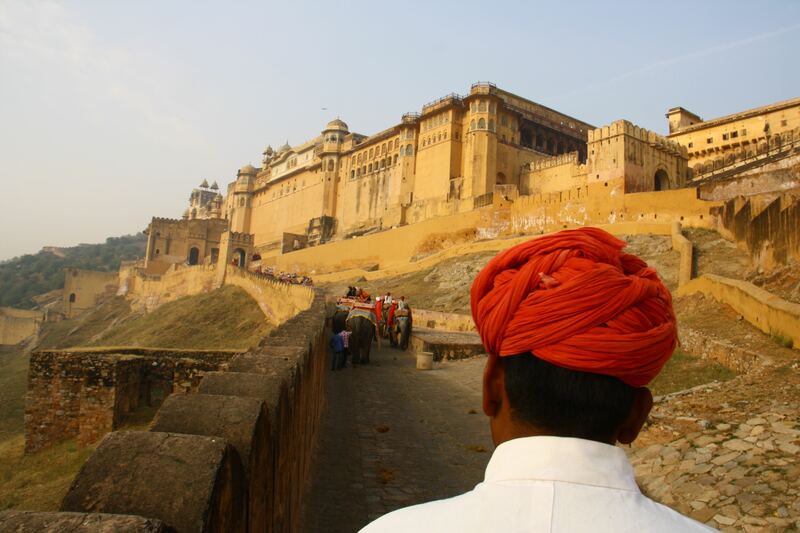 Amer was originally a Rajput fort. The Rajput clans rose to prominence in the northern region in the late 7th century, claiming a high caste warrior status. After losing Delhi and Kannauj to the Muslims, they confined themselves to Rajasthan and their influence is very apparent in the architecture of the state. The fort was augmented over the centuries, with a citadel added in the 16th century and various other buildings, making it a sprawling complex. It reminded me a little of the Alhambra Palace in Granada. I loved it! After coming through the main courtyard area, you pass through the Ganesh Pol, a shimmering three-storey gateway leading to the private apartments of the Maharaja and his twelve wives. 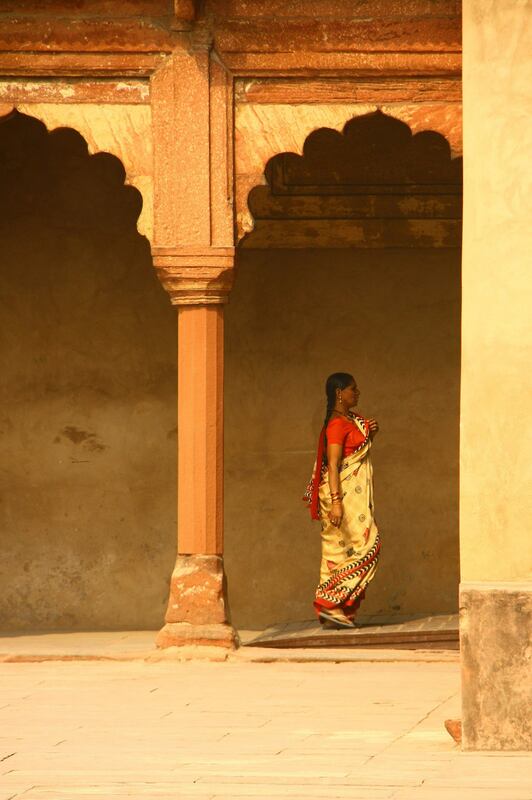 Each wife had identical living quarters with secret passageways to the Maharaja, to prevent any getting jealous that another was favoured or that they were having more private time with king. I thought the Sattais Katcheri, an open area covered in archways where the record books were written, and the Jas Mandir, the private audience room with a marble screen overlooking the Maota Lake below, where particularly lovely, but the Sheesh Mahal (hall of mirrors) was the most unique room. Light from a single candle is reflected in thousands of tiny mirrors embedded in the chamber, transforming it into a twinkly starry night. 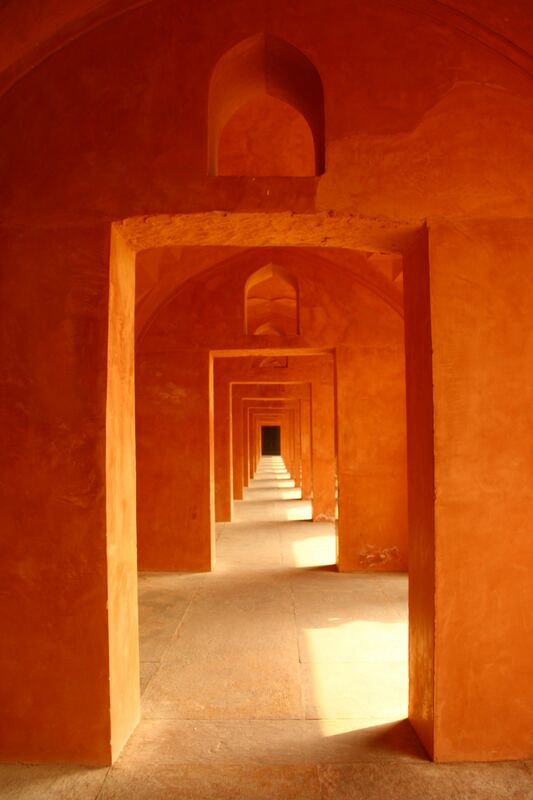 Inside the walls of the pink city itself, we also visited the Jantar Mantar, one of five astronomical and astrological observatories built by Jai Singh II. It is considered the best preserved of the five and looks and feels like a sculpture park, with its weird and wonderful stone instruments dotted about. Some of the instruments are still used to forecast the length of summer and the intensity of the monsoon season. Hindus have come here for centuries to get their astrological signs read, in order to determine if their proposed husband or wife will be a good match. According to Hindu Vedic Astrology, the higher the compatibility of the 36 ‘Guns’ (character traits), the higher the probability that the bride and groom will have a happy marriage. 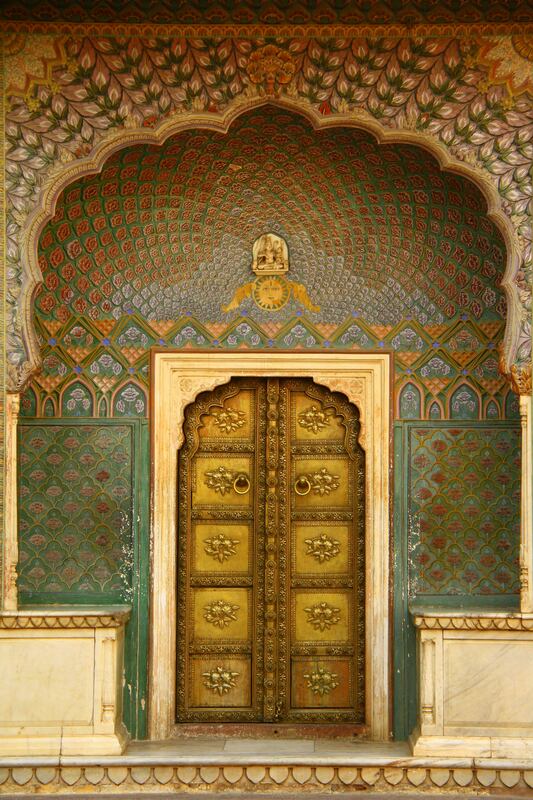 The nearby City Palace is also worth a visit, if only for the Pritam Chowk (‘Court of the Beloved’) with its four stunning painted doorways representing the four seasons. Finally, a trip to Jaipur would not be complete without seeing Hawa Mahal (the Palace of the Winds). This is not a palace that you go in to, but merely a facade. It has, however, become an icon for the city, with many believing that when seen from afar it looks like the crown of Lord Krishna’s head. It is adorned with a thousand or more windows, allowing ladies of the court to watch parades unseen and be kept cool from the searing heat by the gentle breezes that the design facilitates. This entry was posted in Travel and tagged Agra, Amer Palace, Delhi, Elephant, Fatehpur Sikri, Hawa Mahal, India, Jaipur, Jami Masjid, Jantar Mantar, Monkey, Mughal, Palace of the Winds, Ranthambore, Taj Mahal on November 18, 2014 by victoriassecretblog.